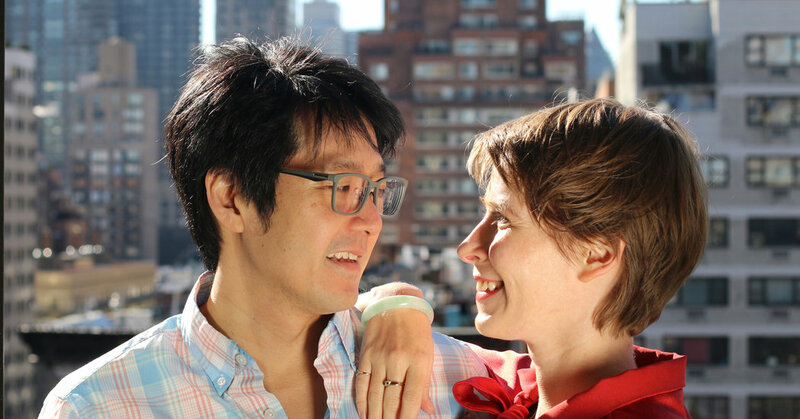 Elizabeth Storm Garner and John Jung Wang were married March 23 at the winter home of the bride’s family in Borrego Springs, Calif. Susan Hwang, a friend of the bride, officiated through California's deputy marriage commissioner for a day program. The bride, who is 35 and known as Storm, is studying for a master’s degree in oral history at Columbia, from which she graduated with a bachelor’s degree in creative writing. She was the costume and production designer for the narrative feature film “South Mountain,” by Hilary Brougher, which had its premiere on March 11 at the South by Southwest film festival in Austin, Tex. She is a daughter of Wendy Feltman Garner and William V. Garner of Washington. Her mother is a landscape painter and muralist whose sky and seascape oil paintings will be on display in April at the Cross MacKenzie Gallery in Washington. The bride’s father retired as an international political consultant. The groom, 37, operates the Queens International Night Market, an open-air night market in Flushing Meadows Corona Park, Queens, featuring vendors selling food and merchandise, as well as cultural performances celebrating the diversity and heritage of Queens and the rest of New York City. He was previously a corporate lawyer with Simpson Thacher & Bartlett, the Manhattan law firm. He holds three undergraduate degrees from the University of Michigan, a bachelor of arts in philosophy, and two bachelor of science degrees, one in biopsychology and cognitive science and the other in mathematical physics. He also received both an M.B.A. and a law degree from Yale. He is a son of Lucy Wong Wang and David Chih-Ping Wang, who live in Arlington, Tex., and Taipei, Taiwan. The groom’s mother retired as a customer service representative at a Toys “R” Us in Arlington. His father, also retired, owned a chain of Chinese restaurants, including three in Manhattan, all named Wok N Roll. Mr. Wang said he “didn’t know what to expect,” at their impromptu reunion, but they quickly turned that romantic corner, and it wasn’t long before Ms. Garner was moving into Mr. Wang’s Manhattan apartment. She brought along her two cats, Attila and Spacebar, who did not get along with his two cats, Audrey and Elmo (who are now living with Ms. Garner’s parents in Washington).